If you ever stepped on a path back to your own childhood and tried to trace memories, and dreams, and hopes, those things that blur in our minds, leaving only fractured feelings, then you will know what this book is about. Everyone has gone down that path, so everyone would know. I did too, and I cried at the end, because I didn't want it to end, this book. It brought me back to my past, to the time when I was little, to the places I imagined that were perhaps real, and perhaps they weren't. I felt like I'm swimming in liquid poetry, reading this, and I don't know what genre it's supposed to be, or what category, or what type of story, but I feel like this is a story for everyone, forever, and always. It's a story for those times when we forget to stop and look at the clouds, and get lost in their shifting shapes, or come back to an old place we remember from our childhood as big, wondering why it is so small now. The story is simple. 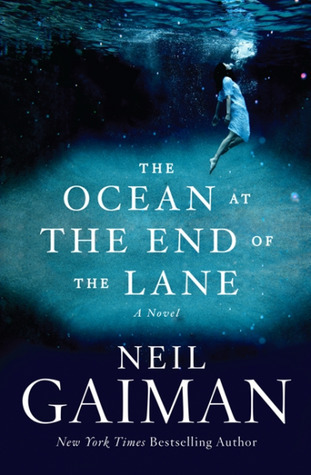 A man travels back home to Sussex, England, for a funeral, and revisits his past, the pond at the end of the lane that his childhood friend Lettie Hempstock called her ocean. Could it be an ocean? And what really happened that day, the day it all happened? And what was it that did? The man sits on the bench by the pond and remembers strange events, one by one, as they happened some forty years ago, events about love and friendship and creation and loss, about strange creatures and birds and wormholes and kittens and, in between it all, about real life and real death and real love. It's achingly beautiful, all of it, and now I want to reread all of Gaiman's books all over again. 5.06% "Nothing happened yet, but I already get the chills." 45.51% "Wow. Found an almost exact sentence as the opening to SIREN SUICIDES." 75.84% "This is beautiful, simply beautiful." 92.7% "No, I don't want this book to end! Please, don't end."